Available In 48" & 96" Lengths, Full Range Of Accessories. Connectrac works in so many applications you'll never need to core drill, trench or install power poles again! If you have a need for connectivity, Connectrac delivers, whether you want to power your entire space or simply to provide power and AV in your conference room, we’ve got you covered. Check out our most popular applications above. 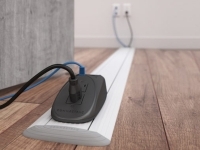 Connectrac is a durable, ultra-low profile floor mounted wireway system which gives you the freedom to deliver power and data cabling without the need for core drilling, trenching or power poles. 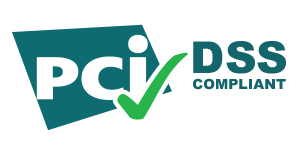 The economical Connectrac solutions can be used with multi-circuit powered workstations, classrooms, libraries, workstations, conference tables and more. They are available in two different sizes—2.7 and 3.7. If AV, data, telecom or power connectivity is imperative for productivity to flourish in your work environment you need Connectrac. 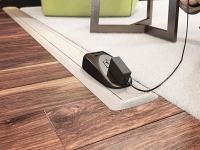 Connectrac powered wires keep all the power, data, or telecom cords organized and centralized, perfect for protecting delicate cables and wires as they run from the wall along the floor to a conference table or work station. Composed of durable aluminum and available in a number of stylish colours, these cable covers will blend seamlessly into any office environment. 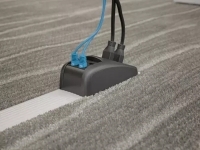 With the ability to be integrated into the carpeting during renovation or simply placed on top of any flooring while maintaining a low profile there is a Connectrac option to provide you with the perfect connectivity solution. Looking for a solution for large open areas to have telecom, AV and power connectivity? 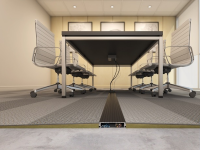 Look no further,our Connectrac Voice and Data Floor Raceways is the anwer. With our color choice of carpet color, you can be designed inspired and still provide functionality in areas where both are needed. Ideal for open space applications in conference rooms, school rooms, fitness facilities, training rooms, libraries, court rooms, retails kiosks, lounges and waiting rooms. 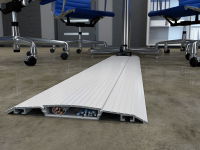 These floor raceways are ADA compliant, UL and CSA approved.